One Wart Will Lead To Another...Don't Wait For Yours To Multiply! Posted on 05/23/2013Your Plantar's Wart Should NOT Be Getting Worse! Posted on 05/06/2013Melanoma Monday...Be Sure To Check Your Feet Too! ?Is a plantar wart the same as a callus? ?What is a plantar wart? 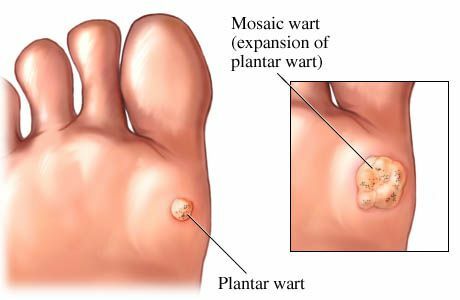 ?Why is it called a plantar wart? Posted on 03/11/2019 Why Does My Child Keep Getting Plantar Warts? If you notice a thick and discolored lesion on your foot, it could be a plantar wart. A wart, or verruca, is a manifestation of a virus that enters your body, often through a crack in the skin. It is contagious and can multiply and spread. Very often, the wart is uncomfortable or painful when you stand or walk. Unlike a callus, which is a thickening of the outer layer of skin, a wart intertwines itself with the skin. This makes a wart very stubborn and difficult to treat. If the skin involved is damaged, it will lead to scar formation which can be more painful to walk on than the wart itself. Most warts, however, do not require surgery and are effectively treated through conservative means. If you walk down the foot care aisle at your local pharmacy, you'll find many different wart remedies. The problem is that they are not strong enough to eliminate most warts. We employ many treatments in our Houston foot care offices to more completely eliminate the warts. If you think you may have a wart, it is better to come in as soon as possible to be treated, before they spread and get out of control.